This is the best midsize crossover for you’re a fan of the 3 Rs: reliability, roominess, and retained value – and fond of the big S, for safety, as well. Highlander seats up to eight, offers a class-fuel-economy champ hybrid model, and comes standard with driver aids – including autonomous emergency braking — that earn it top safety ratings. It’s unchanged for model-year ’18; there aren’t even new color choices. Instead, Highlander skates on a model-year 2017 spruce-up that helped spark a 23-percent jump in sales. The updates included sharper styling front and rear and more standard safety features. A more advanced V-6 and a new transmission furnished additional power and better fuel economy. Toyota added a sport-flavored SE model that introduced marginally sharper handling. And the Highlander Hybrid became much more attainable thanks to addition of lower-priced LE and XLE trims. These were the most extensive changes to this popular midsize crossover since model-year 2014, when it was last fully redesigned. Built with the unified body-and-frame construction that qualifies it as a crossover, Highlander is usefully larger than Toyota’s compact RAV4 crossover and a convenient foot shorter and 1,500 pounds lighter than the full-size, separate-body-and-frame Sequoia. It’s among the more accommodating midsize crossovers, even if the third row isn’t overly hospitable for adult-sized bodies. 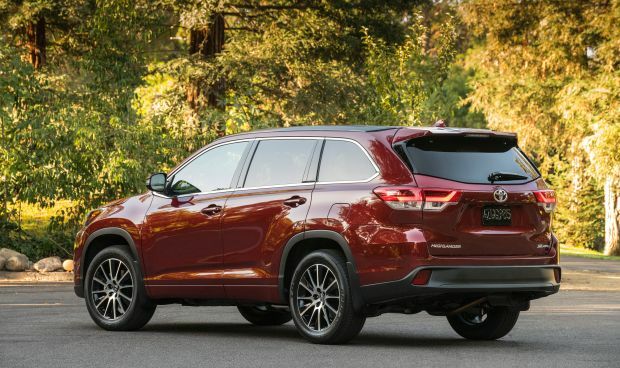 With the next big change due for model-year 2021, and the 2019 Highlander expected to be mostly a rerun, buying an ’18 makes sense. You’ll duck the almost inevitable model-year price escalation on a crossover that’ll likely be the 2018’s visual and mechanical duplicate. And you’ll gain an additional year before the redesign makes this-generation Highlander feel dated. And the percentage of resale value you’ll sacrifice by purchasing an ’18 instead of a ’19 will be negligible within just a few years. A caveat here involves a pending addition to Toyota’s premium Lexus brand. For model-year 2019, the Lexus RX crossover, which is essentially an upscale version of the Highlander, will offer a variant with a third seating row. 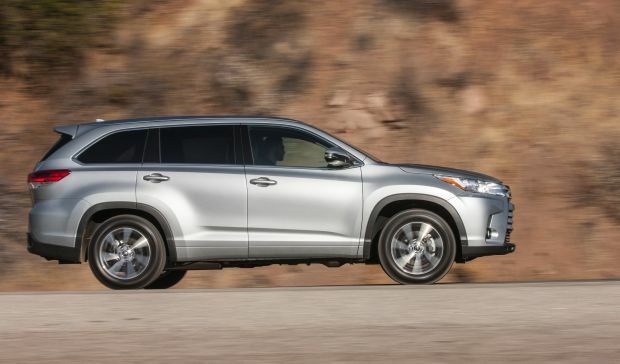 If you like Highlander’s ability to carry seven or eight passengers but crave more luxury and prestige, wait for the ’19 Lexus/Toyota lineups to compare these three-row crossover cousins. As for the ’18 Highlander, it repeats a selection of gas-only four- and six-cylinder engines and a gas-electric hybrid, which is the most fuel-efficient vehicle in the class. The lineup again begins with the rental-fleet-oriented four-cylinder Base model. It continues through six V-6-powered trims: value-priced LE and LE Plus trims; volume-selling XLE; sporty SE; upscale Limited; and flagship Limited Platinum. The Base model is front-wheel drive only, the SE all-wheel drive (AWD) only, the other gas models offer both. The 2018 Highlander Hybrid returns in LE, XLE, Limited, and Limited Platinum form, all with standard AWD. Styling: No, changes. The ‘18s carry over the larger grille and more dashing taillamps that were part of a model-year-’17 freshening that effectively muscled-up Highlander’s look. Each trim level continues with its own grille finish: painted chrome for Limited and Platinum, a shadow treatment for the SE, silver tints for the others. A chrome rear-bumper garnish helps distinguish the Limited and Platinum. The headlamps on Limited, Platinum, and SE integrate LED daytime running lights; the SE’s headlamps have black accents. Outside mirrors on Limited and Platinum integrate turn-signal lamps. LE, LE Plus, and XLE trims have 18-inch alloy wheels, the other models have 19s, with a trendy black finish on the SE’s. The cabin is spacious and airy, with very comfortable first- and second-row seats that are easy to access. Child-seat anchors are provided for the outboard second-row seats, but you can use seatbelt/tether installation in the middle position of both rear seats. Highlander’s second-row seats slide fore and aft and can be adjusted to clear enough third-row legroom to accommodate grownups of medium stature or kids of all ages. Overall, Highlander’s third row is tighter than that in rivals such as the Nissan Pathfinder, Volkswagen Atlas, even the shorter-overall Honda Pilot. It’s comparable to the Ford Explorer’s, and much better than the Mazda CX-9’s. Bottom line: if you want genuinely roomy third-row seating in a unibody Toyota, the Sienna minivan is your answer. Starting with the LE Plus, all trim levels have an 8-inch dashboard touchscreen in place of a 6.1-inch display. Like the climate controls – which feature individual temperature settings for all three rows – the touchscreen is centered on the dashboard, making it easy to reach for the front passenger but a slight stretch for the driver. That’s about the only ergonomic compromise in a cabin that, even at the LE level, provides eight cupholders, four bottleholders, and five USB ports. Interior storage space is a highlight, with special mention due the ingeniously handy shelf that runs along the right two-thirds of the lower instrument panel. Cargo volume is at the upper range of the class. There’s 13.8 cubic feet behind the third row, 42 behind the second row, and 83 with both rows folded. A power liftgate is standard starting with the LE Plus, although no model is available with the convenience of hands-free liftgate operation. Mechanical: No changes. 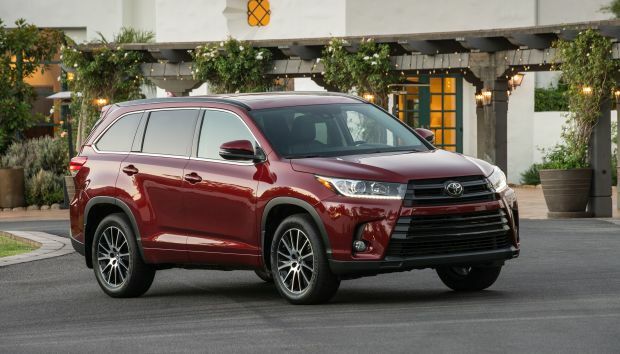 The ’18 Highlander continues the model-year-2017updates, foremost among them a new V-6 engine and an upgrade to an automatic transmission with eight speeds instead of a less-efficient six. The vast majority of Highlander buyers choose a non-hybrid V-6 model. Like its predecessor, the newest six is a 3.5-liter, but it boasts direct fuel injection and other advances to boost horsepower to 295, an increase of 25, and 263 pound-feet of torque, an increase of 15. On LE Plus, XLE, SE, Limited, and Platinum models, the V-6 benefits from fuel-saving stop-start. It automatically shuts down when the Highlander is stationary, then restarts when the driver releases the brake pedal; accessories like air conditioning, continue to run. The fleet-special Base model continues with a 2.7-liter four-cylinder of 185 horsepower and 184 pound-feet of torque and stays with a six-speed automatic transmission. The Hybrid again combines the latest V-6 with battery-electric power. This is not a plug-in. It recharges by recapturing energy otherwise lost during braking and coasting. It, too, got a power boost for 2017, increasing to 306 net horsepower, from 280 (Toyota doesn’t quote net torque for the Hybrid). Here, a continuously variable automatic transmission is used in place of a conventional automatic with stepped gear changes. On all Highlanders, the AWD system is not designed for serious off-roading but intended more as a traction adjunct on snowy pavement or gravel surfaces. Even if you can find one in retail inventory, don’t buy the underpowered, surprisingly fuel-inefficient four-cylinder Base model. Gas-only V-6 versions deliver more than adequate performance, although the eight-speed automatic can be slow to downshift when you need more power at midrange speeds. That’s a tradeoff for its gas-mileage gains over the old six-speed. The Hybrid furnishes surprising acceleration and terrific mileage. AWD is standard on the Hybrid and we highly recommend it on gas V-6s unless you live where it doesn’t snow. Highlander emphasizes ride comfort over sporty handling. Most competitors, in fact, have sharper overall road manners and steering that feels sharper. The SE’s tauter suspension marginally enhances handling, but most buyers will probably choose it more for its unique styling details. Features: The ’18 Highlander continues an exemplary range of standard and optional features. All models come standard with Toyota’s Safety Sense P system, a suite of driver aids for which many rivals charge extra, and even then, reserve for their top trim levels. Toyota’s system includes lane-departure warning with autonomous steering correction, as well as adaptive cruise control to maintain a set distance from traffic ahead. It also includes sensors that can detect an impending frontal collision with a vehicle or pedestrian. It warns the driver, then can automatically apply the brakes to bring the crossover to a stop. It’s this feature that should again earn every ’18 Highlander a rating highly valued by automakers: Top Safety Pick+ status from the Insurance Institute for Highway Safety. All ’18 Highlanders also have highbeam headlights that automatically dim for oncoming traffic, and every model starting with the XLE includes a blind-spot monitor to warn of unseen vehicles in adjacent lanes. A rearview camera also is standard. The Limited Platinum has exterior video cameras that project a bird’s-eye view on the dashboard screen. They’re accompanied by a feature Toyota calls Perimeter Scan, which provides a real-time rotating 360-degree view around the vehicle to help the driver see potential obstacles. 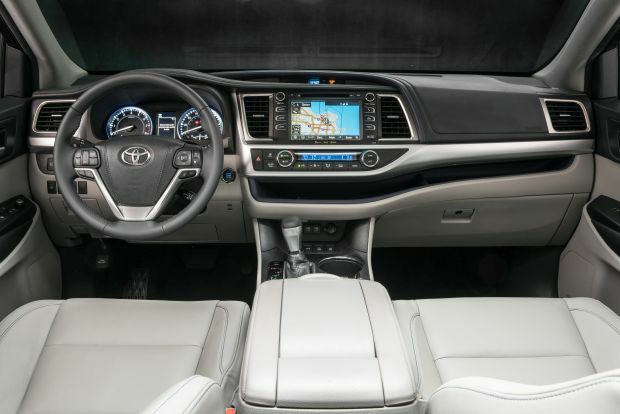 Every model has Toyota’s well-designed Entune hands-free multimedia interface, which responds to the dashboard touchscreen as well as voice commands. Eschewing Apple CarPlay and Android Auto, Toyota uses its own smartphone-connectivity software, which lets you display GPS apps on the touchschreen. XLE, SE, Limited, and Platinum come with imbedded navigation that provides real-time mapping even where there’s no cell signal. All V-6 models also support Bluetooth and Siri Eyes Free support, with Limited and Platinum featuring a premium JBL audio with a subwoofer. Also standard on all models is a windshield-wiper de-icer, darkened privacy glass on all rear side windows and the liftgate; an instrument panel display that tracks fuel mileage and cruising range; and remote locking, with keyless entry for XLE, SE, Limited, and Platinum. All but the Base, LE, and LE Plus grades have Toyota’s Driver Easy Speak system, which can project the driver’s voice through the audio speakers – a sometimes-effective tool to get the kids in back to settle down. A power moonroof is standard starting with the XLE. The Limited Platinum comes with a larger panoramic moonroof with a power sunshade, plus a heated steering wheel and heated second-row seats. After a model-year 2017 jump of $625-$1,705, depending on trim level, Highlander price increases max out at less than $200 for 2018. Base prices are competitive with comparably equipped versions of the Explorer and other three-row rivals such as the Pathfinder, Hyundai Santa Fe, CX-9, and Kia Sorento – and some of those charge extra for the full suite of safety features standard on the Highlander. Base prices include the automaker’s $995 destination fee (Toyotas distributed in some states may carry a different fee). The front-wheel drive-only, four-cylinder Base model starts at $31,625. In the gas-only V-6 line, the 2018 Highlander LE starts at $33,675 with front-drive and $35,135 with AWD, the LE Plus at $36,055 with front-drive and $37,515 with AWD; and the XLE at $39,515 and $40,975, respectively. Available only with AWD, the ’18 Highlander SE is priced from $42,145. Base price for the Limited is $42,675 with front-drive and $44,135 with AWD. For the Limited Platinum, it’s $45,795 and $47,225, respectively. Hybrid buyers again benefit from the 2017 addition of the LE and XLE grades. XLE buyers, for example, no longer need to shell out for a Limited to get such upscale features as the power moonroof, leather upholstery, and remote entry with pushbutton start as standard. Including the standard AWD, base prices for the 2018 Highlander Hybrid are $37,265 for the LE, $42,235 for the XLE, $45,755 for the Limited, and $48,875 for the Limited Platinum. Toyota bundles features strategically, equipping models with amenities for which buyers at the respective price points have shown a desire. For example, the nicely equipped XLE’s sole main factory option is a $1,810 rear seat Blu-Ray DVD entertainment system with a 9-inch ceiling screen, RCA jacks, a remote control, and two wireless headphones. Among Toyota-approved accessories for all models, are running boards ($599), roof-rack crossbars ($350), and remote engine start ($499). V-6 models can tow up to 5,000 pounds; a trailer hitch and wiring harness are a $699 accessory. EPA ratings remain comparable with those of gas-only three-row crossover that have power comparable to Highlander’s, while the Highlander Hybrid again tops the class overall. Gas-only V-6 models rate 21/27/23 mpg with front-drive and 20/26/22 with AWD. Note that ratings for the LE model, which doesn’t have stop-start, are 20/27/23 mpg front front-drive and 19/26/22 with AWD. Ratings are 30/28/29 mpg for the 2018 Highlander Hybrid LE and 29/27/28 mpg for the Hybrid XLE, Limited, and Limited Platinum. EPA ratings for the four-cylinder are a woeful 20/24/22 mpg city/highway/combined. Toyota is transitioning the bulk of its front-wheel-drive-based cars, crossovers and Sienna minivan to a modular understructure that can expand or contract to fit a variety of vehicle sizes and powertrains. This Toyota New Global Architecture, or TGNA, is designed in large measure to give the automaker’s products sportier handling, to go along with far more aggressive styling. It already underpins the automaker’s latest Prius and Camry cars and its C-HR subcompact crossover. TGNA also will be the foundation of the coming fourth-generation Highlander. Don’t expect dimensions to change much, although Toyota probably will find a way to carve out more third-row seat space. Do anticipate a sharper-edged look and even more convenience features. A V-6 engine will remain available, and could be joined by a turbocharged four-cylinder choice. A gas-electric hybrid also will return, possibly transitioning to a plug-in type. A revamp of the navigation system’s control interface. A dedicated button to quickly summon the map display would improve usability. So would a “go back” tab to reverse out of a menu selection. Even with this crossover’s modest cornering prowess, the front-seat occupants would benefit from more lateral bolstering in turns. And some of the suspension tuning that upgrades the SE’s handling, however marginally, would benefit all Highlanders. Ford Explorer, Nissan Pathfinder, Hyundai Santa Fe, Mazda CX-9, Kia Sorento. Family buyers freed from the tyranny of minivan stigma should also consider Toyota’s roomy and refined Sienna minivan, the only minivan available with both front- and all-wheel drive.